While walking the streets of Aix-en-Provence, France, this spring I discovered a little tea shop filled with many amazing tea blends. I couldn’t help but buy a few of those delicious-smelling teas. However, after brewing a few cups, something was nagging me. The teas tasted good but they didn’t taste like the actual ingredients I could see in the blend. I began to suspect they had artificial flavorings added to them. This fall I went to another tea shop with my friend and fellow herbalist Cathy Skipper and we both immediately knew those fancy tea blends had artificial flavorings added to them. So rather than buying expensive tea blends from tea shops that use artificial ingredients, I’ve been creating delicious tea blends at home. Besides enjoying the process of making delicious teas I know I am using the best quality ingredients. These will make fancy, beautiful and delicious DIY gifts. Before we begin, here’s a bit about the tea plant (Camellia sinensis) and some of the benefits it brings. All the different teas such as black tea, green tea, pu’erh tea and white tea come from the same evergreen tree, Camellia sinensis. Each of these teas is processed differently to achieve the different types. Locations where they are grown and when they are harvested also play a role in their quality and taste. Tea is arguably the most popular beverage in the world. It has shaped entire cultures and even fueled wars. Harvesting, processing and even making tea has evolved for thousands of years and is considered a high art form. When I was growing up, I simply thought of tea as a caffeinated beverage or something you drank heavily sweetened with ice on a hot summer day. But the health benefits of tea are astounding. Rich in antioxidants, including catechins, numerous studies have show tea to decrease cancer risk, aid metabolic processes for weight loss, and support heart health as well as longevity. In one dramatic study done by the French, tea drinkers were shown to have 24% reduced mortality rate over non-tea drinkers. They surmised this is due to the health benefits of tea and that tea drinkers seem to have healthier overall lifestyles. Of course, tea is a stimulant and can be high in caffeine. Everyone reacts differently to caffeinated beverages so, as the saying goes, moderation in all things. Rooibos comes from a plant grown in South Africa (Aspalathus linearis). This popular beverage makes a red tea that is sweet, aromatic and caffeine free. Rooibos tastes great on its own but it also is delicious with other herbs and spices. When brewed it makes a beautiful red beverage and because of this it is sometimes referred to as red tea. It is widely known that the poorest quality teas are used for tea bags. Buying bulk whole leaf teas is one way to get better quality teas. However, you still want to buy from a reputable company to ensure you are getting high quality tea. I also want my teas to be certified fair trade and organic. All tea from the Camella sinensis plant contains caffeine. Since some people avoid drinking caffeinated products, I also included two herbal tea blends. Some of these tea blend recipes are measured in parts. I do this to give you flexibility in how much you would like to make of each blend. To measure by parts, you simply choose whatever measurement you would like to be your part. If wanting to make a very small batch, you might choose a tablespoon. Or, if wanting to make a larger batch, you might choose a cup. Whatever your choice, just substitute it whenever the instructions say part. If using a cup, then instead of 2 parts, you would use 2 cups. This tea blend was inspired by the fancy tea blend I bought in southern France. At first I made a similar blend without the orange extract but the orange taste was never strong enough. Then I got the idea of adding the extract and finally the orange flavor popped out. As a result, the dried oranges in this blend are more about their beautiful appearance than actual taste. To dry your own oranges, slice an orange into thin segments, lay them on a glass baking sheet and dry them on low in the oven. Turn them over every once in awhile. Once they are completely dried, cut them into triangle wedges as seen in the photo. Place the teaspoon of orange extract into a quart glass jar. Shake well to distribute the liquid all over the jar. Add the assam tea, pepper, orange slices, cinnamon and cardamom. Shake really well. Let this sit for a day or two to allow the extract to soak in to the tea and spices. To brew: Use 1 heaping teaspoon per 8 ounces of hot water. Steep for 3 to 5 minutes. Strain and enjoy as is or with milk, cream, honey or sugar. I am admittedly very smitten with Earl Grey tea these days. This blend adds a vanilla flavor as well as some beautiful blue flowers to brighten up the mix. To this I’ve added the resinous western redcedar leaves and the aromatic hawthorn leaves and flowers, making this a delicious forest blend. Process the western redcedar leaves into small pieces. Combine all the ingredients together. 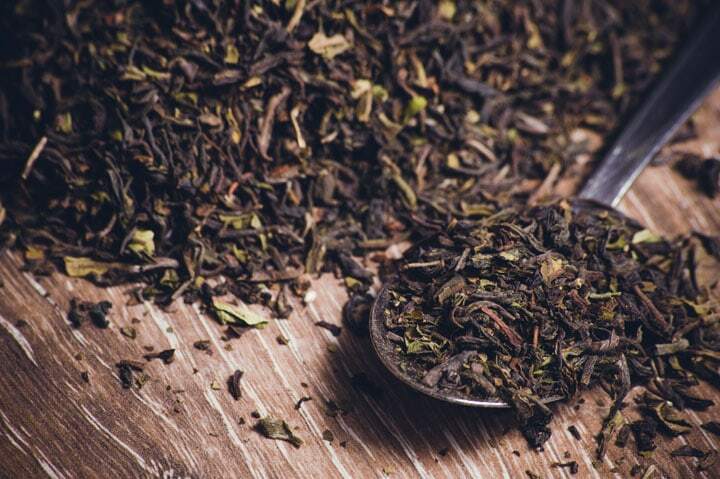 Pu’erh tea is a popular fermented tea that is highly prized by tea connoisseurs. This blend combines the fermented tea of pu’erh with the smoky taste of lapsang souchong tea. The chrysanthemum flowers taste good as well but are mainly added for appearance in this blend. To brew: Use 1 heaping tablespoon per 8 ounces of hot water. Steep covered for 5 to 15 minutes. Strain and enjoy. Rooibos is a delicious herbal tea that does not contain caffeine. It has a slight natural vanilla flavor that is augmented in this colorful blend. To brew: Use 1 heaping tablespoon per 8 ounces of hot water. Steep covered for 3 to 5 minutes. Strain and enjoy. These tea blend recipes can be used exactly as they state, or they could be the jumping off place for you to create your own tea blends. There are endless possibilities here! To give them as gifts, consider putting them in brown tea bags, cello bags or even corked wide-mouth bottles. Be sure to include the ingredients as well as brewing suggestions. Mountain Rose Herbs also carries a variety of tea accessories for brewing single-cup teas that would make a nice gift along with your tea blends. Anyone going to blend some teas for gifts? Yes for sure John! I am making all my gifts this year, so this is an amazing and helpful article. Thank you :). Also, I am curious if the mugs in the pictures were purchased from a particular store or artist? Especially the wooden mug. Or are they happy second hand store accidents? ;) hehe. Thank you for the information in advance. I may, they do sound gift worthy… I wondered if I could get a PDF or ‘printable’ version of these recipes? I am not sure what computer type you have. On my Mac, I can hit PRINT, and not he bottom left of the box, select SAVE AS PDF. Easy as that! John, I am unable to get the pages to print or save as pdf (this option does not appear) and I am using an HP Laptop. Thanks for your help. Leslie, I don’t know how PC’s work, so not sure how to save a PDF from a browser. Some browsers have an “export to PDF” function in the FILE menu above. That will work too. At least my Mac does. Sorry! I have a Dell PC and use Google Chrome as my browser. I use Ctrl + P which brings up the printer. I select the printer I want to use and this article prints beautifully without the ads. I can’t save as a pdf, though. Most browser have an option to add extensions or add ons, there should be a easy print or save to pdf extension you can use. I use one named print friendly & pdf. I have it on my desktops a mac and laptop, it also allows me the option of not saving pictures if I dont want them included. I can click on the various parts of whatever Im saving/printing and delete what I dont want. Then I can save as a pdf or print right away. Hi Chris, I’m running an HP with Windows as well and can print the page from the “File” or “Save Page As” in my browser, but for a nice clean PDF you can go here http://www.printfriendly.com/ to download one. Thrilled to see your piece on teas. There has been another widely circulated Tea “education/advertisement” which may have sounded good to the untrained eye, was filled with unnecessary additives. I take great joy in blending teas and herbal delights for myself and for friends when they come to visit. I look forward to adding these these to my list. Thank you.! Never would have thought off adding herbs to already made tea blend like forest tea. Love the recipes! Thank you. The teas sound and look lovely. Not sure where I’d get the supplies from in England, I also LOVE the moon and stars tea strainer, where is that from? I got the strainer (and the herbs) from Mountain Rose Herbs. Unfortunately they don’t ship to the UK. I buy the Ancient Forest tea for the Chinese ladies at the local restaurant, they go crazy over it! This is a trea they tasted at home and it makes them very happy. I am going to purchase the other components and give them to the ladies as well. I know they will love it! Thank you for these blends, I love them! One question: in the vanilla rooibos blend, it says 1/2 part “vanilla”. Exactly what are we using here? I also have this question about the vanilla. Is it half of a vanilla bean? Thanks for catching that, it isn’t clear. I used vanilla bean powder in that recipe. Digging through the tea drawer I found Ancient Forest Tea that is begging to be gifted. Thank you for the recipes! Hi Sarah, I’m not sure about the orange essential oil. I have very limited experience using essential oils. Thank you for the recipes – they look wonderful! I make a Restorative Blend with Oat tops, Oat Straw, Holy Basil, Gotu Kola and Lemon Balm, drinking it now. Thank you for these, I will be making the Digestive blend. I would love it if you could deconstruct my favorite green tea blend: Yogi Green Tea Super Anti Oxidant. The ingredients are listed but I don’t know the proportions. Have you tried it? It’s wonderful, but I’d like to make it with higher quality loose ingredients! I blend decaf. English breakfast tea with rose petals and a pinch of lavender blossoms. Thanks for the recipes, Rosalee and John! Awesome-looking blends. Thank you so much! I am an aromatherapist (soon to be a clinical aromatherapist) so I know everyone is expecting my blends, balms, soaps and beauty products but just wait until I BAM! them with some handcrafted teas!!!! I love Mountain Rose Herbs (and their 10% off for being an HerbMentor “student”) so can’t wait to get shopping and blending!! Thanks again for your quality program. You really can tell it’s from your hearts!! P.s. I’ve placed my website in but I haven’t got it off the ground yet. Soon I hope!! I noticed that type of cedar grows only in the northwest, and I’d love to make it with something I can find here in Virginia. It said it isn’t a true cedar, but in the cypress family. Can I substitute other varieties of cypress? You’ll need to fully ID the plant you are wondering about down to its genus and species. Then you can research that particular plant through local ethnobotanical guides. I’ve been inspired by your recipes and I have already harvested and dried Moroccan mint, lemongrass and chamomile and calendula. How do you use the rosehips? Whole? I’m a bit wary of the irritating “hairs” inside the hips. Or do you suggest chopping and bagging? If you are straining out the rose hips then you can use them whole. Enjoy!